K and I will be in Bella Italia for the rest of the month, and posting on i-boy will thus grind to a halt until September. I may Flickr a few photos to Facebook, but things will be pretty quiet here on the blog. 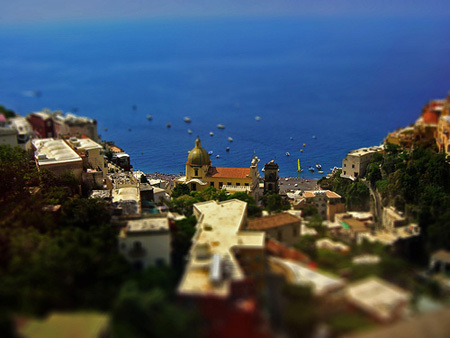 That cool tilt-shift photo of Positano is by Peter Fuchs, by the way. If I have any luck, I'll come back with a few nice snaps myself. In Japan, they've got 100MB connections over fiber, and Mary wants us to think that the internet wasn't set up for video ... Next, she'll be convincing us that the internet is just a series of tubes. popular among a mass audience." FT article is here. The Leading UK internet service providers are warning they may have to restrict customers’ access to the BBC’s new iPlayer service unless the corporation contributes to the cost of streaming videos over the internet. The problem is that they have not kept their promises to deliver high speed networks and had under-delivered compared to consumer demand. The same is true in the US, where Joost's business is certainly feeling the strain of the lack of high-speed access in the States. The fundamental problem that Joost faces is the fact that the broadband available to North American households simply isn’t fast enough for them to provide image quality comparable to digital cable or satellite, much less high-definition video. At 19, Mark Zuckerberg came up with a new way for college kids to connect—and started an online revolution. Now 23, he's trying to build out his business without losing its cool. A user-generated content platform designed specifically for use with any mobile device. Create, upload, collect and share applications (like games, software mashups, videos, blogs, music and photos) all from your mobile. Currently, the site is in private beta. To celebrate our recent success in the Campaign Magazine Experiential League tables, short listing for Experiential Agency of the Year at the IMPACT awards and some great newbiz wins, the team from iris Experience brought the wonderful world of continental drinking to our doorstep today. 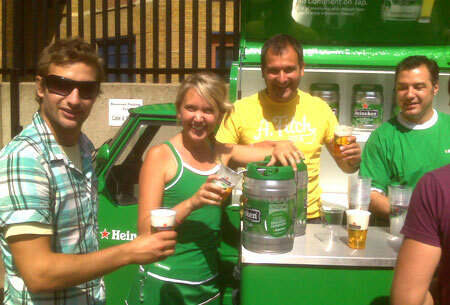 "Lucy", the mobile minibar that serves Heineken draught Kegs pulled up and served cool draught lager to the Nation. Nice way to start the weekend, eh? File under: Never had a chance. Fact is, I haven't read a Maureen Dowd, Frank Rich or Thomas L. Friedman in ages. Have you? Ever since the NYTimes put all their commentary behind a paid wall two years ago, their voices have faded in the blogosphere. They had no resonance. No support. No natural advocacy and distribution. Two years, a couple hundred million blogs, and a gazillion free opinions later, the Times has decided that might not have been such a good idea after all. 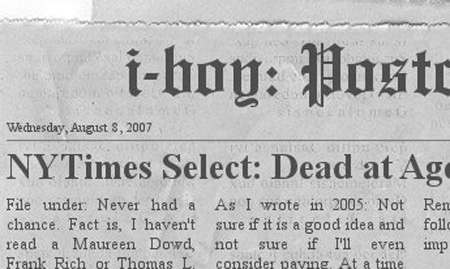 Don't get me wrong, I think the Times is a great paper. Hell, I even worked there eons ago. That said, this was dinosaur thinking at its finest, and it is nice to see that it did not take too long (2 years is bad, but not that bad) to change course. Ironically, the New York Post has the full story. A local store offered freebies to anyone who showed up in their skivvies. What we won't do for free clothes ... Here's the entire set. The photos and video is from iris' own Bob Brown. Intern extraordinaire Luis Carranza was filming the whole time as well. I'm sure an edit of some sort is on the way. Coca-Cola has retained the top spot above Microsoft and IBM in BusinessWeek's annual ranking of the top global brands, while HSBC is the highest-ranking British brand. A few new numbers from ComScore. With Facebook apps - third-party plugins - you can make Facebook into your own personal Mr. Belvedere.